Found Money Guide Reviews - Legit or Scam? Found Money Guide Reviews – Legit or Scam? 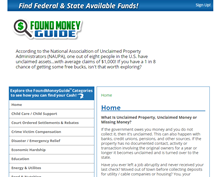 FoundMoneyGuide.com is the online home of the Found Money Guide, a website which claims that many people in the United States may have unclaimed money that they are owed from a variety of potential sources. This website states that one out of eight people in the United States have unclaimed assets with an average of $1,000. These assets can be from the government, banks, credit unions, pensions, and many other sources. Unfortunately if the company or organization that owes you money has no contact information, than that money is held instead of being paid out. Found Money Guide claims to help people find out if they have any unclaimed assets and how to claim them. The website says that customers can go to both State and National websites for resources that can help them. Found Money Guide says that people will need to go to a one of these two areas depending on what organizations they think might have their unclaimed funds. It’s not surprising if someone is unsure of whether a State or National resource would be their best bet when searching for unclaimed funds, so in an effort to help direct you to the right source, they ask their visitors to consider in what areas they think they may have unclaimed assets. Their list of suggested categories includes Child Care/Child Support, Court Ordered Settlements, Disaster/Emergency Relief, Energy & Utilities, Pensions & Retirement Benefits, and more. Is Found Money Guide Legit? The Found Money Guide appears to walk a fine line between legitimate and unethical, not because they are doing anything illegal, but because they work hard to mislead people that they are actually a source of help and a beneficial resource in the attempt to find and locate unclaimed funds. The website claims that other state and federal sources won’t be of much to help to regular citizens attempting to determine if they are owed money, and they present themselves as a place that will solve this problem for people. Unfortunately, they then provide their members with a bunch of links that are generally pretty useless when it comes to locating unclaimed funds. Most of the links are simply informational sources that explain what funds certain people have rights to, and direct people to additional sources if they believe they qualify. In addition to just pointing people in another direction, they actually further complicate people’s abilities to get legitimate information by mixing official sources in with sponsored sources from private companies that are selling goods and services. The only thing that really keeps this website from being a truly unethical company is that they don’t ask their members for money directly, and they clearly label all their sponsored links. The bottom line appears to be that while this company isn’t really unethical, they are at least very unhelpful. Found Money Guide Reviews ? Average Rating for " Found Money Guide Reviews " is 2 out of 5 based on 2 reviews. could you stop popup advertisement on the computer i use. unsubscribe my email address from your list. I am not sure how they ended up on my phone aggravateing me I attempted to unsubscribe on their page three time and each time they notified me it was unsuccessful I do not want this service. My name is Larry Lamont Gatlin and I have received a message from your company that I have some money coming my way please give me a call.